BRIGHOUSE Town hit the FA Cup trail on Saturday after successive wins in the league. Town are at home to Atherton Collieries (3pm) and then head to Bridlington on Monday afternoon to take on Scarborough Athletic in Evo-Stik Division One (3pm). Last season, fellow League members Warrington Town netted around £250,000 for their televised FA Cup games with Exeter City and Gateshead, and, on Saturday, Town will earn a modest £1,925 if they see off the Leigh-based side. 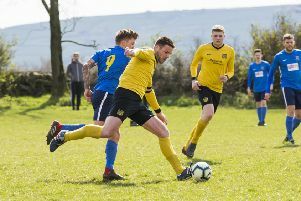 The incentive is there in this preliminary-round tie against last season’s North West Counties Division One champions as the carrot for the first qualifying round is another £3,000. On Saturday, current EBAC Northern League Division One leaders Morpeth Town visit Newton Aycliffe, currently seventh, for the right to come to the Dual Seal Stadium or visit Atherton, on Saturday, September 12 (3pm). Town’s opponents on Saturday, who have commenced their Premier Division season well, were watched last Saturday by Development team manager Charlie Tolley in their only defeat so far, when former Conference side Northwich 1874 beat them 3-1. He reported back to manager Paul Quinn that they were a big, strong side and will have to be given total respect despite playing a level below Town. They beat Bootle 2-0 on Merseyside to qualify for this tie and since then they have beaten Maine Road 4-3, lost to Northwich 1874 and then on Tuesday night won away 4-3 to Blackpool club Squires Gate. Town warmed to their task with a very workmanlike performance – they were especially tight at the back – at Farsley in front of 260 spectators with at least half of them having travelled over from Brighouse. Town officials understand the Greater Manchester side, who have midfielder Josh Messer on a dual registration from Salford City, will also be well supported at the tie. Striker Danny Facey is expected to be back for the game and his class alongside Ernest Boafo, who was marked by two defenders all the game at Farsley but did allow Ryan Hall plenty of room and Steve Hollingworth plenty of space, will be a key component in a must-win game. Town have opened up their team coach on Monday to supporters who want to travel to the Hudgell Solicitors Stadium for the game with Scarborough Athletic who may just have this season to see out on the road down the coast at Bridlington as their local council have passed plans for a 2,500 stadium in the seaside borough. The cost is £10 and bookings will be taken on Saturday if there still room. Town’s commercial manager Andy Stewart, who put in a six-hour shift on Sunday fixing new groundside advertising hoardings, has taken on a most welcome assistant. Avid Norwich City fan and former Ship landlady Marsha Jones has teamed up with the club’s former goalkeeper to bring in more sponsors and advertising for the ground and match programme. Marsha, who is now mine host at the popular Pallet Bar in Ladyship Mills, Ovenden, after leaving her Bethel Street hostelry three months ago, is looking forward to getting round the town and surrounding districts and taking some pressure off Andy who has his thriving business, Halifax Pest Control, to also oversee. “I was delighted to help out when he asked me and I am even getting hold of a paint brush on Thursday night to work on the clubhouse,” she added.